In 2016, Greensman, Inc. introduced an advanced new program for our lawn care customers. A special “Extended LIFE Fertilizer” designed to be applied once in the spring, and which gradually releases its nutrients for 6 months or more . Our "Extended LIFE Fertilizer” gives the lawn a steady supply of nutrients for most of the growing season. 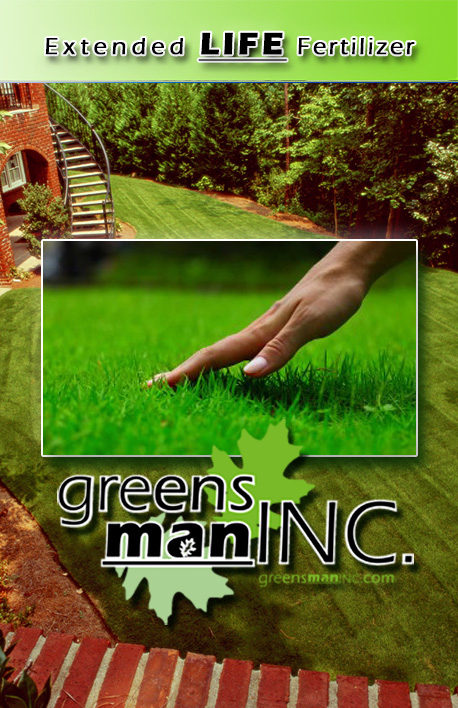 This spring our Extended LIFE Fertilizer became part of Greensman’s standard lawn care program. The Extended Life Fertilizer (with pre-emergent crabgrass control) is applied in the spring and gradually releases nutrients to your lawn only when growing conditions are best. The advanced polymer coating on the fertilizer is sealed during drought and/or cooler temperatures. This is much more efficient than conventional fertilizers. Virtually nothing is lost or wasted from volatilization and runoff. Results that we’ve seen on the lawns we tested this product on have been very good. There was noticeably less stress visible from the drought conditions, recovery was quick, and color and density of the turf was great. Please call us if you have questions. Our Extended LIFE Fertilizer is applied to customers receiving our full lawn care program (5 treatments/yr.). The cost of the spring treatment is higher, and the follow up treatments of weed control, grub control and other supplemental treatments will be less. The frequency of our treatments remains the same (5-6 weeks apart). We appreciate all of our customers. Our goal is to give you the best service that we can. The number one reason that we made this change is we believe that the overall results of our service will be better for you. Do you want a beautiful, healthy and green lawn, but have concerns about the product safety to your family, your pets and the environment? We have families and pets just like you do, and our Eco-friendly lawn care program uses the safest products available, but not at the expense of lesser results. All of our weed and insect controls are registered by the EPA for residential use. Our single application fertilizers slowly feed the turf thru the spring, summer and fall, only when your grass can use it most. Conventional fertilizers can dissolve and leach during wet, saturated conditions, and be lost to volatilization during hot dry weather. The special coatings used in our fertilizers will release nutrients only when ideal growing conditions are present. March to early May Our Lawn Fertility Treatment fertilizer which lasts until fall, pre-emergent crabgrass control, and broad-leaf weed control, weather permitting. Early May thru June *Inspect lawn condition and treat all broad leaf weeds. Advise on lawn’s condition as needed. Grub Prevention Grub control is applied with June thru August treatments and works all season long. Not recommended for all lawns. July thru August * Inspect lawn condition and treat all broad leaf weeds and grassy weeds. Advise as needed. Late August thru September *Inspect lawn condition and treat all broad leaf weeds. Advise as needed. September thru December A late fall booster (winterizer) to feed the lawn through the late fall and winter, and give your lawn an early spring green up. Surface Insect Control Controls bill-bugs, chinch bugs and other lawn damaging insects. Can also control fleas and ticks in home lawns. Can be applied from late spring until early fall. *As the seasons change, changing conditions will bring new crops of broad leaf and grassy weeds. Our regularly scheduled visits will keep these weeds to a minimum, and we can be on the lookout for other lawn problems like damaging insects or diseases. We’ll advise you on best mowing and watering practices for current conditions. Surface insect control and aeration are two additional services that we recommend when they will benefit your lawn. Your lawn technician can advise you on when this is needed.